Developed by William Bernstein. Opposition to the development was strong due to the lack of family homes and the modern appearance. The development was originally to be known as 'Relay House' and at some point during its construction it became known as Pullman Court. 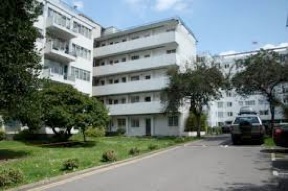 comprising five three-storey direct access blocks fronting Streatham Hill; two five-storey gallery access blocks along the central driveway and two seven-storey cruciform blocks at the rear of the site with flats in a variety of one to four rooms. Internally the flats were planned to be as 'labour-saving' as the technology of the time would allow. They were heated by a central boiler plant, a great convenience compared with the traditional coal fires which was the more usual form of heating in the 1930s. Gibberd designed a range of furniture which could be purchased by tenants to complete their flats in an appropriate fashion. Other amenities included roof gardens, an open air swimming pool at the rear, a restaurant and social club, lock-up garages and storage areas, with landscaped grounds providing a parkland setting. Abridged from estate website (see below).